Hi folks and welcome to the latest Patch 7.9 tier list! This patch showcases massive reworks on the tank class, and Sejuani, Zac, and Maokai have a ton more depth to their kits now. Unfortunately, it looks like Sejuani's the only one reaping massive benefits so far, but the potential on Zac and Maokai's kits seem like they just need a few number tweaks to bring them over the top. Cassiopeia [Tier 2 Mid] - When Riot first introduced Adaptive Helm, there were a lot of "R.I.P. Cassiopeia" sentiments floating around the internet. Turns out, most of her damage against enemy teams comes from killing people who don't build tank items anyway, so pretty low impact on her this go-around. Karthus [Tier 1 Mid] - I think a lot of players are still sleeping on Karthus. The changes to his Lay Waste [Q] in the previous patch made him much smoother, and allows for Karthus players to land quite a few isolated Q's on enemy targets. This results in quite an oppressive laning phase, and a lot more precision during team fights as well. Lee Sin [Tier 1 Jungle] - The largest change this patch for Lee Sin is clearly the re-itemization of Guardian Angel. As a champion that continuously dives into the enemy team to make high risk-plays during the late game but is reliant on his damage to snowball the early game, Lee Sin players are jumping for joy. This item allows Lee Sin mains and would-be mains to remain relevant during the late game and still aim for high-risk plays. Even if they fail, they still deal higher damage to their initial target than before. Maokai [Tier 2 Top] - Maokai's rework looks really good on paper, but hasn't panned out so far in practice. His ultimate is just a bit too slow as a primary initiator, and his damage/waveclear is not quite high enough to be oppressive in lane. We'll see how he pans out over the course of the patch, but so far he looks balanced. Rakan [Tier 2 Support] - Rakan's struggling a bit in the new patch. His win rate increased from his introduction, but that was expected from a champion with such an overloaded kit. However, the new support itemizations definitely feel like an indirect nerf and he still has no way to reliably proc Face of the Mountain. This results in an unfortunate situation for a champion that likes to dive into the enemy team. Meanwhile, the sustain change on the yellow support item line-up makes it difficult for him to get back into the game if he loses early trades and gets zoned. 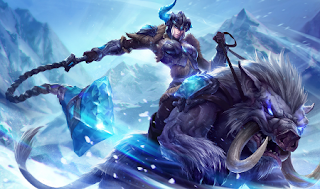 Sejuani [God Tier Jungle/Top] - In a nutshell, the new Sejuani is a BEAST. Her jungle clear is great and her ganks are good, but it's really her passive that's incredibly difficult to deal with. The double stun on her Permafrost [E] and her Glacial Prison [R] make it incredibly difficult to escape once you get CC'd, resulting in a champion that is extremely good at crushing high-priority targets before she can be burst down. Sona [God Tier Support] - The new haste buff on the blue gold item at 650 tribute is insanely good on Sona. It allows her to easily weave in and out of battles with minimal danger, and she starts to feel like Janna. When you combine the blue gold item passive with Sona's Song of Celerity [E], she's almost permanently untouchable by skill shots if you're on the lookout for them. Thresh [Tier 1 Support] - The latest Face of the Mountain buff is turning out to be incredibly good on Thresh. He is a champion that needs to get tanky, but doesn't have as much in the way of passive stats as melee champions. However, with FoTM's change, he gets a lot more in the way of early free-stats, which allows him to snowball harder. Zac [Tier 3 Jungle] - Similar to Maokai, Zac looks really good on paper and the changes on his ult synergize quite well with certain champions like Orianna and Miss Fortune, but it just doesn't play out quite as well in practice. There's a ton of utility on his kit that I really like, but it takes a little too long to activate for the speed and predictability of his moveset.